FREE TASTER SESSION ALWAYS AVAILABLE- please book your session. 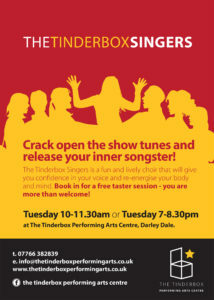 If you’ve always enjoyed singing (car, shower, karaoke…), then come along and join The Tinderbox Singers. Singing songs from musicals to pop, let’s have fun together and gain confidence in our voices. There isn’t an audition to become a member, just enjoy singing and how it makes you feel. Singing is great for our well- being- each session energises our bodies and minds. Every now and again, the choir perform locally and we join with the evening Singers. Book in for your free taster- you are more than welcome! Class led by the principal of The Tinderbox, Andrea Turner. Accompanist, Jennifer Demichelli, The Tinderbox resident pianist. Payment to be made on receipt of invoice. Refunds will not be made once payment has been received. No refunds are made for non-attendance of students. Any classes cancelled by The Tinderbox Performing Arts Centre will be rescheduled. No reimbursements are made. Please contact us to reserve your place now. 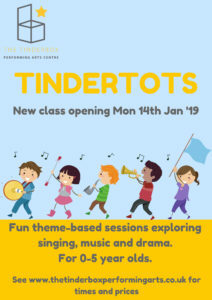 Bring your little sparks down to The Tinderbox! We have fun exploring singing, music and drama in theme-based sessions. We could become pirates for the morning, using our imaginations to walk the plank and make the sounds of the sea with musical instruments! Or maybe we sing songs about farm animals and make up stories about our favourite pets. Fun and creativity aplenty. Coffee and juice break included. And biscuits…of course! Parent/carer must attend with their child/ren. Children aged 0-5 years old. Payment to be made on receipt of invoice- refunds will not be made once payment has been received. Any classes cancelled by The Tinderbox Performing Arts Centre will be rescheduled and no reimbursements are made. If TTPAC are unable to reschedule, reimbursment will be made. The Tinderbox artistic director, Andrea Turner, will lead weekly workshops for the theatre company. Using fun drama games, improvisations and devising, the group will develop their skills and confidence. We will explore different genre of theatre, such as Verbatim, Physical, Realism, Musicals etc, so that we have creative ideas to draw upon when we are devising and staging plays. As part of the year, the group will rehearse (during the weekly session) for a production. The aim is to perform plays that engage the audience and they leave feeling entertained and excited by what they have just seen. 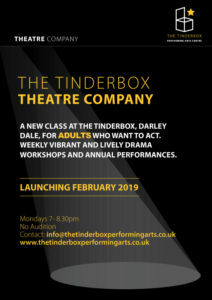 The Tinderbox Theatre Company is for adults who have the acting bug and want to grasp it with both hands. Have fun creating drama, developing skills and producing engaging performances. 18+ year olds. Men and women. Please contact us to book your place, free taster session and for more information. The same as the Singers Daytime choir, but in the evening! An adult choir for men and women who love to sing. From the acclaimed ‘Les Miserables to ‘All that Jazz’ from Chicago to Leonard Cohen’s ‘Hallelujah’, the Singers rehearse a range of show tunes, pop and arrangements for contemporary choirs. We have performances throughout the year and we get together with the daytime choir for these- the more the merrier! You are more than welcome to book in for a FREE TASTER SESSION. We would love to see you. All abilites welcome. No audition. No refunds are made for non-attendance of members. Please contact us for information and to book your place.